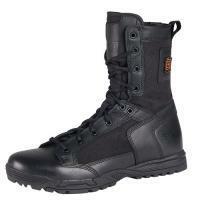 511 Tactical Skyweight Side Zip Boot (12318) FREE SHIPPING! Designed to provide maximum speed and agility, the 5.11 Tactical Skyweight Side Zip Boot is a first choice for performance footwear. An integrated nylon shank increases torsional rigidity for superior stability without the added weight of steel. A specially engineered metal-free design reduces overall boot weight and energy output allowing you to move faster for longer. A breakthrough combination of a low profile 8 mm heel to toe drop with a unified heel break provide increased acceleration and the momentum regulation needed to stop on a dime. A broad forefront encourages podiatrist-approved toe splaying for increased traction and improved balance. Designed for the diverse needs of tactical professionals, this boot has built in arch lugs for superior traction on ladders and ropes. Because comfort is a priority, this boot is built with OrthoLite® insoles to disperse impact and eliminate foot fatigue. Regardless of where your feet land, you can be sure you will stay on them with the 5.11 Skyweight Boot. ©2002-2019 CopsPlus.com: 511 Tactical Skyweight Side Zip Boot (12318) FREE SHIPPING!